Since the Miami Dolphins had gone 14-0 in 1972 and advanced to win the Super Bowl, no other NFL team had put together a perfect record. Entering Super Bowl XLII on February 3, 2008 the New England Patriots were coming off a 16-0 campaign in the 2007 regular season and had beaten the Jaguars and Chargers in the playoffs to win the AFC title. To be sure, Head Coach Bill Belichick’s club had struggled in some late-season contests, but the Patriots were as formidable as the record indicated, having set league records by scoring 589 points and 75 touchdowns. The offense was directed by QB Tom Brady, who threw for 4806 yards and set a new standard with 50 TD passes. Veteran WR Randy Moss, a newcomer to the Patriots in ’07, caught 23 touchdown passes and gained 1493 yards and steady WR Wes Welker pulled in 112 receptions. RB Laurence Maroney was the best of an unexceptional but solid group of backs. The defense was tough and filled with savvy veterans such as NT Vince Wilfork, OLB Mike Vrabel, and CB Asante Samuel. Not even allegations of spying on opponents in past seasons could cause the confident Patriots to lose focus. Their opponents in the Super Bowl were the New York Giants, a team they had barely gotten past in the regular season finale. Coached by Tom Coughlin, the Giants were hardly as dominating during a 10-6 campaign in which they finished second to the Cowboys in the NFC East and entered the playoffs as a fifth-seeded Wild Card. They then won three straight road games, over the Buccaneers, Cowboys, and Packers, to advance to the Super Bowl – the latter two wins coming as decided underdogs. QB Eli Manning (pictured above) had struggled with consistency but he had risen to the occasion in the postseason. The team had a fine group of running backs and, despite playing with an injured ankle, WR Plaxico Burress was a dependable target for Manning’s passes. The defense was the key to the team’s success, however, in particular its ability to mount a pass rush and stop the run. New York’s defense had led the league in quarterback sacks with 53. Still, the Giants came into the game as 12-point underdogs against the undefeated Patriots. It was a chilly night at University of Phoenix Stadium in Glendale, AZ with 71,101 fans in attendance plus the typically-massive television audience. The Giants showed poise in their first possession, taking 16 plays to go 63 yards and using up almost ten minutes while converting four third downs along the way. Eventually, they ended up with a Lawrence Tynes field goal from 32 yards. New England responded with a long drive as well that followed a 43-yard kickoff return by Laurence Maroney. On a third-and-10 play at the New York 17, LB Aaron Pierce ran into TE Benjamin Watson as he reached for the ball in the end zone and drew a pass interference penalty. Two plays later, and at the start of the second quarter, Maroney ran for a one-yard TD and, with the successful extra point, the Patriots took the lead at 7-3. 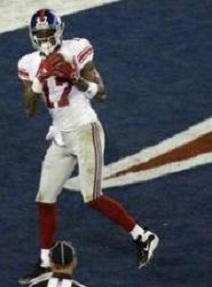 The Giants drove inside the New England 20, with the big play a pass to WR Amani Toomer for 38 yards. But for the first time in the postseason, a Manning pass was intercepted when WR Steve Smith bobbled a low throw and CB Ellis Hobbs grabbed it. New York’s defense held and the teams traded punts. Midway through the period, the Giants sacked Brady on back-to-back plays. LB Kawicka Mitchell and DE Michael Strahan combined for a six-yard sack and then DE Justin Tuck dumped Brady. A promising series for the Giants reached the New England 25, but Manning had the ball knocked out of his hand when hit by LB Adalius Thomas and, while New York recovered, the Giants were penalized ten yards for an illegal touch by RB Ahmad Bradshaw. They were ultimately forced to punt. The Patriots were driving just before halftime when Brady fumbled when hit by Tuck. New York recovered but a Hail Mary pass into the end zone fell incomplete. The Giants had run more plays (34 to 27) and dominated time of possession (19:27 to 10:33) but were down by four points at the half. The Patriots had a long series to start the third quarter and it was extended when the Giants, thanks to an astute challenge by Coach Belichick, were found to have 12 men on the field during a punt that thus gave New England a first down. The drive was further helped along when Brady connected with RB Kevin Faulk for 14 yards in a third-and-13 situation. But after advancing to the New York 25, Brady was sacked on a third down play by Strahan and, rather than try for a field goal, the ensuing fourth down pass fell incomplete. Early in the fourth quarter, the Giants put together an 80-yard drive that started with Manning tossing a pass to rookie TE Kevin Boss that turned into a 45-yard gain when SS Rodney Harrison missed the tackle. The series was capped by a five-yard touchdown on a Manning pass to WR David Tyree that put New York in front with just over 11 minutes remaining to play. Following a trade of punts, New England came back with a 12-play scoring possession. Brady found Randy Moss alone in the end zone for a seven-yard TD that, followed by the successful conversion, put the Patriots back in the lead at 14-10. There was 2:39 to play as the Giants regained possession. Manning threw to Toomer for 11 yards and, four plays later, they converted a fourth-and-one situation to stay alive. Shortly thereafter New York faced third-and-five with time running down. Manning, barely avoiding being sacked, threw to Tyree who, clutching the ball against his helmet, made a sensational catch for a 32-yard gain to the New England 44 (pictured at right). A toss to Smith picked up 12 yards on a third-and-11 play and then Manning tossed a pass over Ellis Hobbs that Plaxico Burress caught for a 13-yard touchdown with 35 seconds left on the clock. Starting at their own 26, the Patriots were unable to pull off a final comeback as Brady threw two incomplete passes, was sacked, and then unsuccessfully went long for Moss on the final play. The crowd erupted as the stunning 17-14 upset was completed and the Giants, having won a road game for the eleventh straight time, were officially champions. The Giants led in total yards (338 to 274) although New England had the edge in first downs (22 to 17). New York stuffed the Patriots’ running game (45 yards on 16 carries) and sacked Brady five times for a loss of 37 yards. New England’s defense got to Manning three times, at a loss of just eight yards, and the Giants gained 91 yards on the ground in 26 attempts. Each team suffered one turnover. 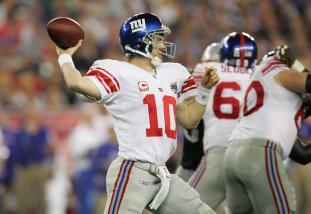 The game’s MVP, Eli Manning, completed 19 of 34 passes for 255 yards with two touchdowns and one interception. Amani Toomer caught 6 passes for 84 yards and Steve Smith contributed 5 receptions for 50 yards while Plaxico Burress (pictured below), held to two catches for 27 yards, had the game-winning TD. Ahmad Bradshaw rushed for 45 yards on 9 carries and Brandon Jacobs gained 42 yards on his 14 attempts. For the Patriots, Tom Brady, under heavy pressure throughout the contest, was successful on 29 of 48 throws for 266 yards and a TD with none intercepted. Wes Welker had 11 pass receptions for 103 yards and Randy Moss caught 5 passes for 62 yards and a touchdown. Laurence Maroney paced the running game with 36 yards and a TD on 14 carries. “We shocked the world but not ourselves,” summed up Giants LB Aaron Pierce. New York won the NFC East with a 12-4 record in 2008 but was ousted in the Divisional playoff round by the Eagles. The Patriots, having lost out on a perfect season, lost Tom Brady for the year in the season-opening game but, with backup Matt Cassel at quarterback, still went 11-5, although it wasn’t quite enough to return to the postseason. There was a rematch of the two clubs in the Super Bowl following the 2011 season – with similar results.